Portable Air Conditioner FAQs • 20 Questions, Asked & Answered. Your Home. Your Questions. Long Answers. Below are the most frequently asked questions that homeowners have about portable air conditioners. Click on your question to go directly to the answer, or browse around to learn more. You choose you’re own adventure. What is a Portable Air Conditioner? Do portable room air conditioners work? Are these air conditioners energy efficient? Do all portable air conditioners need to be vented? What is a window vent kit? What if I can’t vent the AC unit? Can I vent a portable AC through a dryer vent? How long is the exhaust hose? Can I make my own exhaust hose? What’s the difference between a single-hose and dual-hose unit? Do portable air conditioners give off carbon monoxide? Is a portable AC the same thing as an evaporative cooler? How loud are portable air conditioners? Can you soundproof a portable air conditioner? What type of electricity do portable air conditioners use? Can you use it to cool multiple rooms at the same time? Will these AC units work for garages? Will these AC units work for server rooms? Is a portable air conditioner the best choice for me? Where can I buy a portable air conditioner? Designed to be moved from room to room with ease, a portable air conditioning unit is a smaller cooling appliance that vents directly out of your window, but doesn’t require permanent installation. Generally, this type of air conditioner is engineered to cool individual rooms, not your entire home. To make it easier to move around, portable units often have wheels on the bottom and built-in handles on the side. Yes, of course. They are a popular alternative to central air conditioners, and one of the better choices for cooling rooms in your home. Of course, the amount of benefits you receive from a portable air conditioner is entirely dependent on how you use, how well you maintain it, the environment you are using it in, and a whole host of other factors. But, yes, portable air conditioners do work when used correctly. It depends on how you use it. 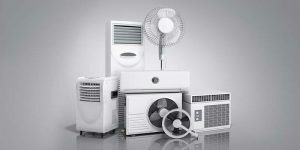 When compared to other types of air conditioners, portable units are going to be one of the worst for energy efficiency. 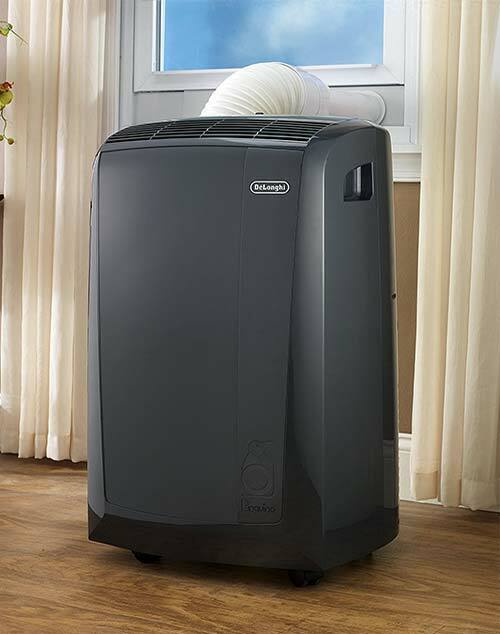 Across the board, portable units tend to have a lower Energy Efficiency Rating (EER) than other air conditioners. The overall efficiency will vary per each model or brand, and you certainly will find some units that have a higher EER than others, but for the most part, this appliance is not considered as one that is energy efficient. However, they do have the advantage of allowing you to cool only one room at a time. This cooling strategy will help you save money and cut your overall energy usage, as you’re not having to pay to cool your entire home. From this perspective, one could absolutely make the case that it is energy efficient. Yes. You will need to vent your air conditioner. This is typically done through a window, but you can also buy a vent kit that works with sliding glass doors, casement/crank windows or through a dropped ceiling. Most portable air conditioners will come with everything you need to properly vent the device, including an exhaust hose and an adapter that sits in your window sill. Just remember to follow the instructions for the model. The window vent kit will come with your portable air conditioner. Typically made from plastic, this is the piece of equipment that sits in your window sill and connects to your exhaust hose(s) of the AC unit. The window venting kit will typically fit most standard-sized windows and sliding glass doors. However, before you buy a portable air conditioner it would be wise to measure the window and ensure the venting kit that comes with the AC unit will fit in your home. There are many venting kits available online, including many designed for larger windows and casement windows. That would be unfortunate. If you are unable to properly vent your AC unit, then this type of air conditioner will not be a sufficient cooling option for your home. You would want to consider an evaporative cooler. 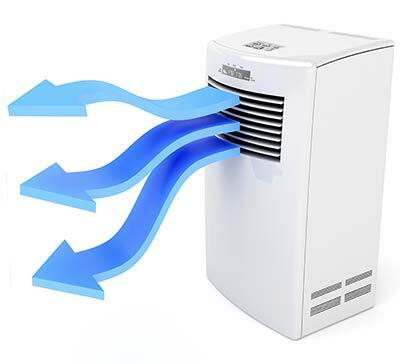 Portable air conditioners work by moving hot air out of the room, so if you’re unable to use a vent, then the machine will not cool your room in an efficient or effective manner. You may feel some cooling if you are directly in front of the unit, but you’ll also notice some ambient heat building from the back. Sure, it’s possible. But, it’s probably not the best idea. This is definitely not a good idea if the diameter of the hose doesn’t fit the diameter of your dryer vent. Unfortunately, this is often the case, as many dryer vents in American homes have a diameter of 4 inches, and most portable air conditioners come with a larger vent hose. If the diameters of the hose and dryer vent are the same diameter, you could attempt to vent your portable air conditioner in this manner. But, again, it’s not recommended and may lead to other problems. So, if you do attempt this, keep a close eye on the device until you feel confident that it is venting appropriately. It varies. The hose or duct that comes with your portable air conditioner will vary from model to model, but they typically are at least 3-4 ft. in length. You can buy longer (or shorter ones) at many retailers. While it is generally recommended that you buy a longer exhaust hose from the same brand or retailer that you bought your AC unit, this is oftentimes unnecessary. However, it is important to understand that the longer you make the exhaust hose, the less efficient your air conditioner will be. This may also lead to your unit having to work harder to cool the room, which may cause the compressor to work harder than it should possibly shortening the lifespan of the air conditioner itself. It would be wise to keep the exhaust hose shorter than 10 ft, unless you also have an exhaust fan of some sort that will help the hot air escape and allow your portable air conditioner to work in a more efficient manner. Sure, but it’s not recommended. There are many scenarios in which a homeowner may desire a longer exhaust hose for their portable air conditioner. Unfortunately, the longer the exhaust hose, the less efficient the AC unit becomes. If you want to replace the exhaust hose, it is best to buy one that is designed for this type of air conditioner, but if you’re in a bind or feeling handy, you can purchase many of the necessary materials at a hardware store, such as Home Depot or Lowes. Keep in Mind: If you go this route, make sure the replacement hose is the same diameter as the previous hose or the venting duct in the back of the unit. Most portable air conditioners have a 5 inch hose, but not always. Double-check before you buy. You could also consider using a PVC pipe, but that, too, comes with many disadvantages. The way the air moves in and out of the device. Choose a dual-hose, if possible. Single Hose — All air comes in and vents out of the one hose. Dual Hose — One hose is used to pull in air from outside, and the other hose is used as an exhaust. 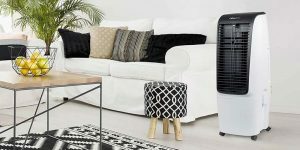 Dual-hose portable air conditioners are considered to be the better of the two options, as it is more efficient and can cool your living space quicker than single-hose units. No. Because it runs on electricity, you do not have to worry about a portable air conditioner emitting carbon monoxide into your home. 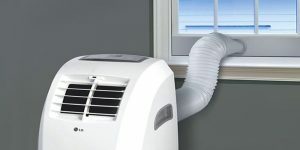 In extreme circumstances, it is possible for a portable or window air conditioner to pull in air from the outside that is high in carbon monoxide. This is possible when a fuel-burning device is directly on the other side of the window. These may include a running car, portable generator or a grill you may be cooking on. Again, this is an extreme scenario and it is unlikely that a portable AC will pull in enough carbon monoxide for you to experience negative symptoms. But, just in case, it would be wise to know what is going on near the vent, as well as have a carbon monoxide detector in your home. No. These are two very different cooling appliances, and not an ideal substitute for each other. An evaporative cooler, sometimes called a swamp cooler, uses water and the process of evaporative cooling to help make the temperature of the room feel cooler. Unlike portable air conditioners, you have to add water to an evaporative cooler for it to work, and it does not require any sort of ventilation. These are great for garages and workshops. It depends on the model you buy. Like most appliances in your home, the amount of noise (or the decibel level of the device) will depend entirely on the model itself. All types of room air conditioners will emit some level of noise, with some being louder than others. Most homeowners consider this as background noise or white noise, much like your refrigerator or dishwasher. Unfortunately, decibel ratings are not a spec that manufacturers advertise for portable air conditioners. To get a better idea of how noisy a particular model may be, you will have to read over reviews for each unit and try to make an educated decision for yourself. Not really, but you can take steps to lower the noise. If you buy a portable AC and find it to be loud, you can take a few steps to lower the noise. Softer Surface — Take a look at the surfaces the AC unit is sitting on. If you have it positioned on a hard floor, then you should try to put a small rug underneath the unit. This will help lower the amount of vibration of the compressor and internal fans, and help make it a little more quieter. Change the Fan Speed — It’s also important to note that the decibel level will likely change depending on the fan speed that the device is currently operating on. If it is operating on the highest speed, you will likely hear a little more noise. Again, the above steps can help you soundproof it, but you will never be able fully eliminate the sound a portable air conditioner makes while it is operating. For typical residential use, portable air conditioners only need to be plugged into a standard electrical receptacle found throughout your home. You will not need any extra power or a special wiring setup to use this type of air conditioner. The only time you may need a special plug or a dedicated circuit for operation, is for large commercial-sized air conditioners. This depends on a few factors, but is certainly possible. These include the environment in which the air conditioner is being used, how well the air is circulated in this area, and the BTU rating of the device itself. As an example, if your living space is very open and you’re using a high-BTU unit, then you may feel a cooling effect throughout the entire space. However, if you have a lower-BTU rating and the space is contained with lots of doors and walls, the device will have trouble cooling all areas in an effective manner. To help you cool larger rooms, consider using a small fan near the air conditioner to help the cold air reach far corners of the space. Not really, at least not very efficiently. You can use them pretty much anywhere there is a plug, including inside your garage or workshop. Unfortunately, if your garage door is wide open or the area is not well-insulated, then it is unlikely that you will feel the temperature drop. To cool your garage, you should consider using an evaporative / swamp cooler. Absolutely! In fact, cooling a server room is one of the most common uses for a portable air conditioner. Due to the heat that servers generate, especially when clustered together in a small room, it is crucial for you to keep them cool in order for them to operate in an efficient manner. 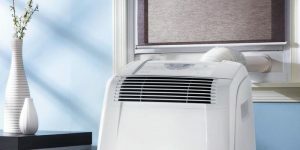 Because of this, portable AC units are often used in conjunction with a central air conditioner to help cool the room with the computer equipment. If you have a small server room in your home or small business, you may have buy a special vent kit or longer exhaust hose to properly vent the AC unit. It depends on your situation. This type of air conditioner is great for anyone that wants to cool one room or area of their home, but is unable to do so with a window unit. Do you want to have a window A/C unit sticking out from your home? If not, then you should go with a portable unit. Do you live in an area with a zealous Homeowner’s Association? If so, then they’ll likely have rules in place to prevent window units, therefore leaving a portable air conditioner as the best choice. Do you care about your energy usage of a room air conditioner? If so, then a window unit is going to be the best choice for you. Are you capable of installing a window unit? If not, then perhaps you skip the hassle and go with a portable AC. 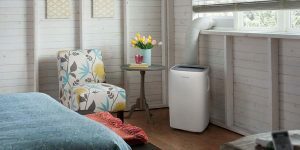 Keep in mind, a portable air conditioner is a popular cooling option used in millions of homes around the world, but they certainly comes with their own set of pros and cons. If you do your research and make an educated buying decision, you’ll be happy with your choice. You can buy portable air conditioners from a wide variety of retailers, both online or in stores. See all portable air conditioners on Amazon Prime. Before you buy a portable air conditioner at Walmart or Home Depot, we would recommend browsing your options online and narrowing down which model would be best for your home. You don’t have to buy online, but you’ll at least have comfort in knowing that you made an educated buying decision. Have a question that you didn’t see listed here? If so, please add it down in the comments below. Thanks for the info. I was thinking of buying this type of air conditioner. But I don’t know how to vent it. What if I don’t have a window. Must both hoses be vented to the outside. Can the intake hose just accept the inside air. Can I put the hose in a bucket of water instead of out the window? Is it safe to run a portable air conditioner on a timer plugged into a wall outlet? My portable AC unit has a timer to shut itself off, but I would like it to turn back on also. I’ve used plug in timers with lamps; is it safe to do the same with the AC? Can A Portable Air Conditioner Save Money On Energy Bills? Robot Vacuums: Are They Really Worth It?